We’re looking for a killer band or solo artist to win and test out the Electro-Voice ZLX BT speakers. Need big sound for your live rig or rehearsal space? Learn more and enter below. Electro-Voice’s ZLX line is the worldwide best-selling portable PA speaker, with excellent sound quality at its price point. ZLX is “often imitated, never equaled” – we’d go so far as to call it the go-to for pro sound and reliability in a very affordable package. Now Electro-Voice has added Bluetooth streaming to the ZLX lineup, raising the bar even higher for features-per-dollar. Here’s the deal: we’re looking for a great artist to win and demo the new 12-inch models for us. Ideally, this will be either solo artists, duos or bands in need of a PA speaker upgrade. The winners will get a new pair to keep, and will shoot some short product demos and behind-the-scenes videos that we’ll share on our site and social media channels. 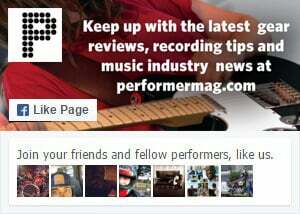 You’ll also be featured in an upcoming print issue of Performer. Cool, huh! Scroll down for more detailed info about the new ZLX BT line from Electro-Voice, and good luck! Entrants must be from the Continental United States. DEADLINE to enter is November 19, 2018. Winners will be announced no later than the third week of November 2018. Please note that we will not share, rent or sell your data. Good luck! Electro-Voice has expanded its ZLX series – the world’s #1 portable powered PA speakers – with two new Bluetooth audio streaming “BT” models: ZLX-12BT (12-inch 2-way) and ZLX-15BT (15-inch 2-way). The BT models combine the superior components, coverage and clarity of the standard ZLX models with the latest Bluetooth technology to deliver the lowest-noise, highest-fidelity streaming experience in their class, from any mobile device: wireless convenience with Electro-Voice sound quality. QuickSmart DSP — the original onboard DSP with single-knob control and LCD. Optimize ZLX to suit your style and space. QuickSmart DSP processing: Easy application/location setup via four presets, sub/top system-match, two-band EQ, five user-programmable presets, visual monitoring of limiter status, input level control and meters, and master volume control to optimize gain structure. Lightweight, super-durable composite construction with three-handle design for effortless pole mounting and portability. With its stunning enclosure design, ZLX looks as good as it sounds. LEARN MORE at the ZLX series page by clicking here.